And Then There Were None is my favourite Agatha Christie story, so I’m not sure whether that makes me an ideal candidate to review a stage version or quite the reverse… either way, I’m happy to report that All & Sundry’s performance was gripping, professionally acted and thoroughly enjoyable, and judging by the audience reactions, I wasn’t the only one who thought so. Having wondered whether this particular adaptation would remain faithful to the book or follow the route taken by the various screen versions (that is to say, change the ending completely), I must confess to being slightly disappointed that it was the latter, offering a more upbeat and romantic ending which seems a bit of a cop-out and rather disputes the play’s very title! However, it was Christie herself who adapted the novel for the stage, realising that her original conclusion presented certain dramatic difficulties: if there’s no-one left alive at the end, who will tell the tale? The murderer making his confession in person instead of in a letter certainly works very well on stage – especially due to Mike Richardson’s commanding performance – and indeed none of the necessary changes proved detrimental. Not sure why the character of Dr Armstrong had been re-cast as a woman, but again this made little difference to the plot. 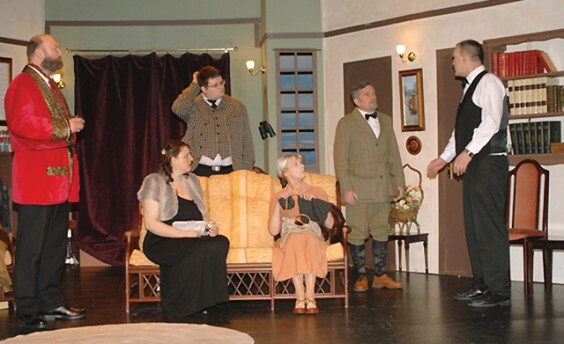 The cast made great use of the confines of the set, which saw all the scenes taking place in one room with several doors leading off to convey the feeling of a large house and terrace, enabling some of the action to occur just out of sight but within earshot of the audience. In fact most of the murders took place offstage, and the ones we did see weren’t gory or graphic – not a blood bag to be seen – although the very effective gunshot sound effects made us jump every time (even those who were expecting it!). There was much hilarity when a shot in the darkness failed to go off, leaving us with a frantic clicking noise for some moments, but the odd technical hitch is par for the course and just added to the entertainment. In a strong ensemble cast, other stand-out performers were Dave Berrisford as roguish adventurer Captain Lombard and James Ralley as larger-than-life Mr Blore, while Rory McGhie made the most of his brief role as reckless boy-racer Anthony Marston – a shame his character is one of the first to be dispatched, as we were rather enjoying him!